Please ignore the dirt around my windows. Thank you. 2. Fill the gap between the window screen and window frame with removable rope caulk. I used rope caulk over peel able removeable caulk because I could still easily pop out the window screen from the inside of the house in the case of an emergency. I also don’t have to buy pealable caulk each season. I can remove and save the rope caulk from season to season if need be. This is an excellent solution for renters too. Please keep ignoring the dirt around my windows. Thank you. 3. Switch out the summer screens for winter storm windows. (If I had winter storm windows.) I could seal the outside (or inside) of my windows with plastic sheeting. Plastic sheeting isn’t as efficient as storm windows but it is cheaper and much better than leaving them bare if you have leaky windows. I’m not going to do it because I don’t think my HOA would go for plastic on the outside of the house and frankly I don’t like the look either. Since my windows are double paned and pretty efficient, I concentrate on sealing the little gaps around the windows. As always, your mileage may vary. 4. Put a cover on the air conditioner. Warm heated air is drawn to cold air and vice versa. An air conditioning cover encourages the warm air to stay inside the house during the winter. If I had a window unit, I’d remove it for the winter and close the window. Do as I say not as I do. In my previous rental I learned the hard way how much colder a room can be when you don’t remove the window air conditioner from the window during the winter. Don’t be me. 5. Check gaps around outlets, faucets etc. and caulk if needed. This one still looks pretty good. Looks like I forgot to caulk the gap around the outdoor let on the porch. Better get on that. 6. Disconnect and drain outdoor garden hoses and insulate the faucet so they don’t freeze and possibly burst. There might be a DIY solution to this, but I took the easy way out and bought a $4 insulating faucet cap at the home improvement store. The interior hook fits around the faucet and it screws into place. Easy to do and remove in the spring and reuse the next year. 7. Check if the garage door leaks. This is one of the most overlooked areas of detecting and sealing air leaks in the home. 8. Take terra cotta and clay pots inside when it gets frosty outside or the pots might freeze, thaw, and crack. 9. Check your chimney. Since I have a gas fireplace the installer recommends that I check it for cobwebs and spiders and whatnot that like to call such small dark places home because they can interfere with how well (or not) your fireplace works. That’s how I prep the outside of my house and keep my utility use and winter heating bills low. What do you do? Do you have any tips? Did you enjoy this post? Get more like it by subscribing to the Condo Blues RSS Feed or to Condo Blues by Email. I could have used all of those tips at my former home. I wouldn't have thought to check several of those areas. Thanks for sharing the tip about the faucet. We just had a weatherizing program come through the house and inspect. They have been hard at work and are still busy with the attic... 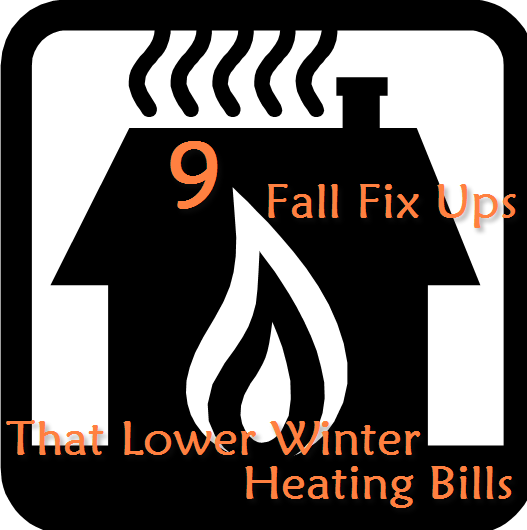 I'm actually excited to get our utility bills this winter! I'm soooo showing this to my hubby!! Great tips! Perfect timing, perfect tips! We forgot to cover our central unit outside, and once we finally got around to it (*cough remembered*) it did make a difference! We so need to do this soon. I know it will make a huge difference. Thanks for sharing on Tout It Tuesday! Hope to see you tomorrow.